Orthodoxy teaches that matter matters! A classic quote from St Maximus the Theologian is as follows: “One Creator of all enters into all things, proportionately to each, through humanity, and the many things that differ from one another by nature come into one, converging around the one nature of man. And God himself becomes all things in all, encompassing all things and giving them real existence in himself, because none of the things that exist any longer has random movement devoid of his presence.” St Maximus is not making distinctions between man and beast, rather he is explaining how we unite with the cosmos, for ours salvation, while God is becoming “all in all” as described in Ephesians 4. 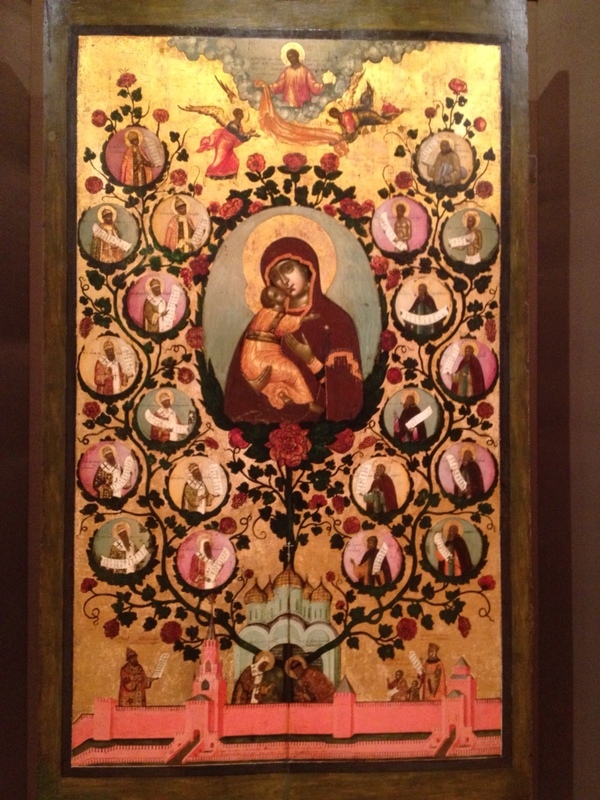 The icon ‘the tree of the Muscovite state’ is a Russian Orthodox icon which demonstrates the ecclesial and communal aspects of life growing together through nature itself to become a living reality. Russian Orthodoxy has been known for centuries to carry the tradition of the ancient Byzantine Empire where the Church thrived (not without struggle, of course) as a community, sanctifying the land that God gave her to cultivate (create culture). The icon shows both ecclesial and communal leaders watering the same trunk that merges the nation together. This illustration is important to the Church in more ways than mere political and social struggle. Salvation itself is dependent on nature and all things living. Christ himself is a heavenly embodiment of nature, who came to save us from the very destruction of nature. The power of Christ easing and lifting our cursed nature enables us to “become gods” as Christ states. We do not simply avoid sin to become holy. The Orthodox way is much more positive. Sin is avoided, but not as a cause of holiness. Sin is to be outmoded with the power of God and ALL that he gives us. Orthodoxy is known for this merger of both physical and spiritual within iconography, the teachings of the fathers, and of course the teachings of the Holy Scriptures. In the Lord’s Prayer we pray: “Thy will be done, on earth as it is in heaven.” The way of salvation is to merge the spiritual with the physical, preparing our way for eternal life. The Spirit of God works with nature; albeit, with great labor, due to the fall of mankind in the Garden of Eden. God said that man would labor the cursed ground for his food and that women would labor in pain for children and be subjected to their husbands. In other words, it would be difficult to work with nature in all its form. But in this New Covenant we are given power to overcome the curse through Christ. The cursed nature will not be fully liberated until the return of Christ, but while we are here we take part in this specific “way” of life, this merger of physical and spiritual. The early Christian called the faith by the name of “the way,” as we can see within the book of Acts. As Eastern Orthodox Christians we see this life as a journey. We believe that there is a path, a way. This means not so much as obeying laws of morality but obeying laws of grace, encompassing nature itself, with mankind as the core of operation. St Paul says that “all things work together for our salvation.” All THINGS. He goes on to say that the earth itself groans. The earth itself and all of her creation has much to do with our salvation. Our salvation works in harmony with nature. Some ancient groups worshiped aspects of nature, which is idolatry of course. Orthodoxy, on the other hand, is a convergence of both heaven and earth, spirit and material, soul and body. It is not a balance of sort, rather it is holistic. Heaven and earth – souls and cultures, work together in harmony. We have a number of ancient symbols for this convergence of the spiritual and the material, including the tree in the icon above and the double headed eagle which was also a symbol of the Church working with the nation in what is referred to as symphonia (symphony). The harmony of the Church and State is only the outer shell, so to speak, of an entire manifestation of God’s grace upon nature. All of life matters to God and the Church has been given this matter – this earth – as a gift from God. The Incarnation, Transfiguration and Resurrection of Christ are all important realities to embracing the material world. Grace is within the natural world as Christ became material for material. The Transfirguration of Christ teaches us of the reality of the transfiguration of the world when the whole of material creation will be renewed. This is one of the reasons for the Orthodox Church to venerate the bodies of saints. As St Gregory Palamas states, the grace of God does not abandon the bodies of the saints after their physical death. St Symeon and St Gregory Palamas both teach us that to properly exercise ourselves within the world, to “till and keep” creation and to avoid becoming a “useless instrument” is crucial to our avoidance of sin. St Symeon says that man should become a “useful tool working all good.” It matters what we do within the world not just by considering the invisible reality of the kingdom but also the visible reality of the kingdom as a whole.